Sounds like what a hypnotist might say to put you in a trance, right? It’s also a pretty good description of you falling asleep. If your head is on a pillow when it happens then, by all means, sweet dreams. But if you’re sitting in the driver’s seat of an automobile, you’re headed for a nightmare because drowsy driving kills. According to the National Highway Traffic Safety Administration, over 100,000 automobile accidents and 1500 fatalities are caused every year by drowsy driving. And those numbers are conservative, as there is no “sleepiness” test to determine if a driver was under the influence of drowsiness at the time of a crash—like there is with alcohol. Still, studies have shown that drowsy driving is just as dangerous as driving while intoxicated. If you’ve ever found yourself fighting sleep behind the wheel—and surveys show that most of us have at one time or another—consider these 7 ways to avoid drowsy driving as a wake-up call that just might save not only your life, but the lives of others. 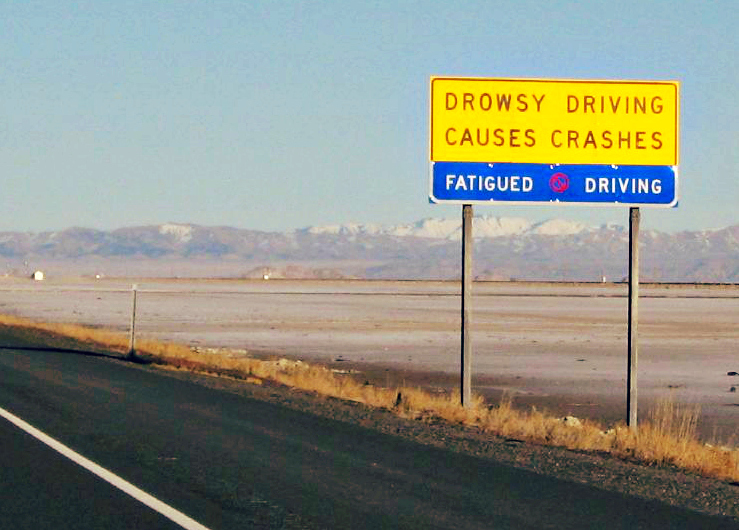 Sounds like a no brainer but the best defense against drowsy driving is to get plenty of sleep. It may seem like a good idea to set the alarm for 4 a.m. so you can get an early start and beat the traffic. But if you don’t get adequate sleep—7 to 9 hours is recommended—before you get behind the wheel, there’s a much greater chance that you’ll doze off on the road. If you have a sleep disorder that is depriving you of sleep, be sure to seek proper treatment. Everyone likes a good road trip. Instead of driving long distances solo, invite a friend to come along. Driving companions help keep you more alert, plus you can share the wheel with them so you’re not stuck doing all the driving. We’ve all experienced energy dips in the afternoon. It’s often caused by a natural lull in our sleep/wake cycle, but having too much sugar earlier in the day can also cause that afternoon crash that could lead to a crash. If you often find yourself yawning in the afternoon, avoid driving during 2pm and 4pm, as crashes due to fatigue often occur during that time frame. Long-distance drives can be monotonous, depriving your brain of needed stimulation to keep you alert and aware. According to the National Sleep Foundation, you should take a break from driving every two hours. Just taking a few minutes to stretch, walk around, take deep breaths and get your circulation going can work wonders for relieving driver fatigue. Healthy individuals without medical conditions that can be aggravated by caffeine—high blood pressure for instance—can reach for caffeinated beverages such as black coffee to help stay alert on long drives. If drowsiness still occurs, it’s best to pull over and take a 15-20 minute nap. According to a recent study published in the journal “Sleep,” caffeine was better than a nap at increasing alertness and driving skills in drowsy people. Dull, drowsy brains can be stimulated by sharp changes in your immediate environment. Rolling down windows to let in fresh air, cranking up the air conditioning, or upping music volume and singing along are good ways to change things up and stay alert. When you’re starting to experience the symptoms of sleepiness and none of the tricks are working, it’s time to pull over. Try a quick nap and if that doesn’t help find a motel and get a good night’s sleep. Thinking that you can somehow fight off sleep while behind the wheel could spell tragedy for you and others on the road.